Yamuna River passing through the city of Delhi is the main source of drinking water supply to the city. Seventy percent of water supply for drinking water in the city comes from this river. 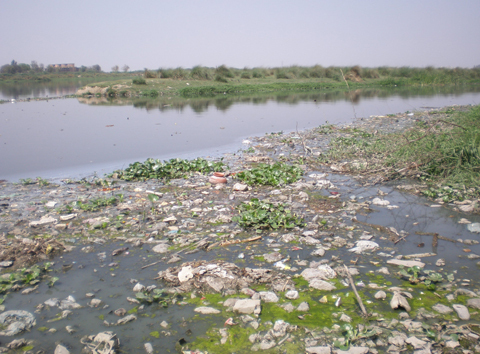 While bulk of the water for drinking comes from Yamuna River as much as 3,538 metric liters of waste water flows through 19 drains out falling into the river every day. Rivers have an automatic rejuvenation quality naturally provided and at any given time 10 percent of the volume of water is flowing and not stagnant. But Yamuna suffers from inadequate flow and quantum of water. It is not want of spending money, as much as Rs. 1200 cr. worth of efforts were spent on Yamuna Action Plan Phase I (YAP I) and Yamuna Action Plan Phase II on creating the infrastructure in treating the waste water that gets generated per day in the city. Setting up of Sewage Treatment Plants (STPs) along 42 towns and cities in the upstream of the river was part of the YAP I, while the Phase II was mainly focused on Delhi Metropolitan city. Serious deficiencies and backlog in sanitation and waste water services has resulted in the dwindling of water flow as this is 80% of the source of pollution in the river. The main challenge in Phase II was to ensure that the waste water coming from the development of informal housing along the river bank is provided with sewage and sanitation collection network. This proved to be an extremely difficult challenge for Municipal Corporations within the Delhi Metropolitan region. Formal housing supported and built by any development authority – be it Delhi Development Authority (DDA) or others – the sewage and sanitation infrastructure is planned and constructed along with drinking water supply pipelines. Of the total population of 13.9 million people in Delhi, about 3 million or 45% live in Jhuggi Jhompadi. However these informal settlements popularly called the JJ are constructed by slum dwellers strictly on a need basis. So the housing is constructed first followed by water supply and electricity, but open defecation is a norm and waste water is let out on the streets. The Honorable Supreme Court of India has constituted a committee and has drawn up an action plan for cleaning of river and rejuvenating it. But without any commitment and cooperation from the people living in these slums. It is a dual challenge at the engineering level, having build pucca housing, it is extremely difficult to construct the sewage and sanitation under it and requires sustained community efforts. At financial level it requires persuading people who are trying to survive in the city to think beyond survival and start thinking about quality of life and health of the next generation. This requires a different kind of health education and commitment by the slum dwellers, difficult but not impossible. The black stagnant river mirrors the challenge. Environmental anthropologist by training, been in the field for over 20 years. I am mainly concerned with the infrastructure and technology project impacts on people communities and their physical environment. Their adaptation and mitigation strategies, interests me, now especially in the context of climate change and CDM. NextEarth Day 2009 at Chacha Nehru’s House!